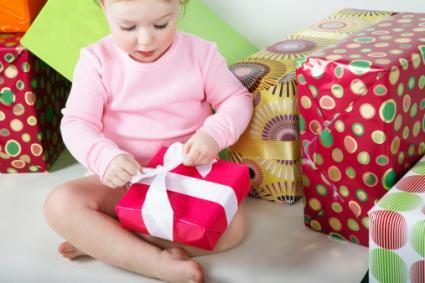 Toddlers can be a finicky bunch, so when it comes to choosing a birthday gift for them, it can really get your creative juices flowing. Ideas can range from gifts you can buy in a store to those you make with your own two hands. Use these ideas as inspiration for creating a happy toddler at his or her next birthday. If your budget is a bit tight and you want to put a little more thought and creativity into a toddler gift, make your own. Toddlers are just learning to use their imaginations, and you can foster their creativity with a variety of homemade toddler birthday gifts. Decorate a cardboard box or plastic bin with brightly colored wrapping paper or contact paper. Visit your local dollar store and look for items that could be used to play make believe and/or dress up. Fill the box with inexpensive leis, hats, jewelry, play shoes, boas, scarves, wands, swords, and masks. Inspire the toddler in your life to love growing things. Purchase an inexpensive pot and paint it with colorful acrylic paints. Include a small packet of soil, packets of seeds, and even a small spade or shovel. Toddlers love watching seeds that they've planted grow! 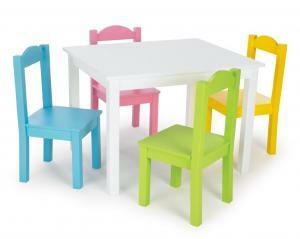 Suggest parents hang the piece of plywood on a wall at the child's height so they can reach it and play with it. Take a large box and pull three of the four flaps off one side and all four off the opposite end, so hands are hidden below the flap and kids can reach into the puppet box from the back. Leave the bottom flap attached and pull up, taping the sides so it stays. Cover it with colorful fabric using a hot glue gun. 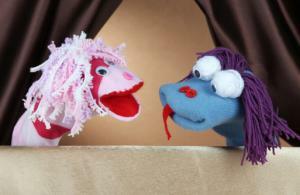 Include sock puppets or finger puppets that you've made yourself. Turn your sewing or quilting skills into making a cloth book. Andrea Dekker offers some page layouts for a cloth book. You can make the pages simple or more complicated, depending on your sewing skills. A no-sew quiet book from Powerful Mothering works if you have no sewing skills at all. Create a set of fish using card stock, cotton balls, yarn, and a hole puncher. Color or create designs on the fish if you like. Each fish needs two sides. Use the hole puncher to create holes around the edge of the fish. Stuff each fish with cotton balls and weave yarn through the holes to attach the two sides together. Add a loop of yarn at the mouth of each fish, so the toddler can hook the fish. Tie some string with an open paper clip for a hook to a wooden dowel rod to create the fishing pole. Attach magnetic strips that you can buy at any local craft store to the back of wooden puzzle pieces or toys. Viola, you have toy magnets kids can play with for hours. 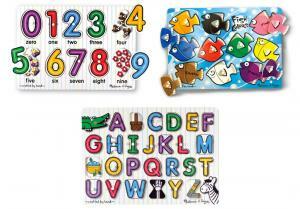 Include a large cookie sheet for them to put the puzzle and toys pieces on that will function as their magnetic board. Find round, flat, and smooth rocks - 26 in total. Clean them and paint them in solid colors of your choice. Then paint each letter of the alphabet onto each stone. If desired, gather enough rocks to include the numbers 0 through 9 as well. Find a brightly colored plastic bin and fill it halfway up with play sand. Add a pint-sized shovel, sand sieve, rake, and sand molds. Be sure the bin has a secure lid. Add a large bow, and you've created a mobile sandbox for some lucky little boy or girl! Toddlers love finger paints, brushes, chalk, colored pencils, art paper, and crayons. Toddlers also like playing with modeling clay, so allow them to create art sculptures by including several packages in the basket. Make bath time a fun time for a toddler by filling a bucket with bath crayons, bubbles, sponge toys, bubble bath, and bath squirters. Also include a fun hooded animal towel to make getting out of the bath just as fun as staying in it. Fill a grocery basket that is filled with play dishes and utensils, play food, pots, pans, and other cooking accessories. If you want, you could also pick up a toy grocery cart and fill it with similar items for a larger gift. Toddlers love puzzles, so you can't go wrong if you purchase a colorful bin that could house several stacked puzzles. Look for puzzles that are age appropriate and feature various shapes, pictures, colors, and/or numbers. Puzzles that make noise, like farm sounds, are a bonus! Find a small travel suitcase for kids. Look for one with their favorite character or animal. 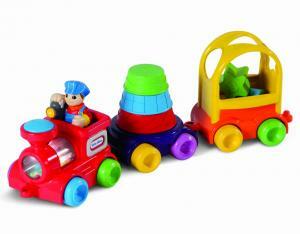 Fill the suitcase with kiddie travel items. Coloring books, crayons, books, their favorite movie, a blanket, and some snacks are good ideas. You'll have to leave out the ice cream itself, but you can include all the other fixings. Place ice cream cones stacked together inside of a cellophane wrap and tie off with a festive ribbon. Add a packet of sprinkles, a packet of chocolate chips, a packet of mini M&Ms, and some gummy worms or bears. Add a small tub of chocolate fudge and caramel sauce. 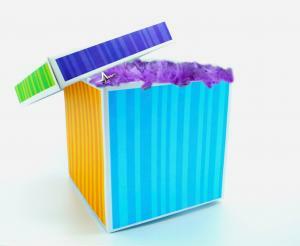 Place inside of a nicely wrapped gift box and tie together the bottom and lid of the box with a brightly colored bow. For toddlers, it is more about the gift than the thought itself. If you put yourself in the shoes of toddlers for just a few moments, you can come up with some great gifts ideas that they're sure to enjoy.